You’re probably here to learn custom software development cost. Software development pricing is a crucial factor for anyone who intends to build something digital. Though, it’s not that easy to estimate its cost. A vendor has to know software type, target platforms, and clearly defined set of features. In this article, I’ve tried to give you a comprehensive pricing on software development services and to explain the key factors influencing the final cost. In our experience, mobile and web applications are the most demanded kinds of software. Let’s focus on them. Basic apps (approx. 500-700 hours). They can be built quite fast, but their functionality is quite simple. Medium complexity applications (approx. 700-1200 hours). This software has more complicated features. Complex applications (1200+ hours). The software of this level is time-consuming to engineer due to complex architecture, security matters, multiple integrations, etc. Of course, the categories above are rather subjective. So I would like to provide you with approximate estimations of different kinds of apps so you could see the whole picture. The prices are based on the average rate in our region (Eastern Europe) — $50 per hour. In order to roughly count the software development price, it’s necessary to provide the company with some basic information about your project. Haven't found anything similar to your project? Contact our managers to get a custom estimation of your project for FREE. Idea. For example, you want to create an app like Tinder. So, you explain your idea to technical specialists of the company and they develop an MVP for you. Wireframes. The engineers would be grateful for your vision of design. Examples of the competitors’ apps or websites. Instances help you show developers what functions you adore and don’t like. Design. There can be just the ideas of what you like. A lot of vendors help their clients to collect all necessary data as well as our company. So you can just come up with the idea and we’ll do the rest. Such factors as the number of platforms, complexity of architecture and animations may completely change the final price of software development. All these factors should be considered and double checked beforehand. Modern IT world provides three popular platforms for software development and, of course, the software development price quote will vary according to the platform. Do you want an Android or iOS app? Or maybe all you need is a web application? There are some points that need to be considered. Cannot decide what platform to cover first? Find out our insights: iOS or Android - what to start from? For example, if you already have an iOS app, it’s impossible to convert it into Android application and vice versa. It happens because these platforms take over different programming languages, have unlike SDKs and require different development tools. So, if you want your application to work on two or even more platforms, be ready to spend more money and cooperate with different developers. People are visual creatures, so design becomes a vital part of software development cost breakdown. UI/UX design is able to attract users’ attention and engage them. Developing design can take quite a lot of time depending on a website type and its complexity. The first thing for you to know is that there are two web development types: front-end and back-end. Front-end or client-site is everything that users can see and interact with. As for back-end or server-side, it's like an engine for the app. For example, when a user clicks the registration button, the app first connects to the server to check the data and then returns a value to the user (e.g. wrong credentials, a user already exists, registration successful). That’s where back-end starts to work. It’s necessary to consider that the development of iOS applications typically requires 20% or ever 30% less time compared to Android. It happens because there are much more devices run on the Android platform. So, it’s necessary to provide support with a lot of versions of this OS and different screen resolution. Quality assurance services are extremely important for the development process. It’s vital to test every component of the software in order to prevent or solve any possible bugs. The cost of testing in software development always depends on the complexity of your project. 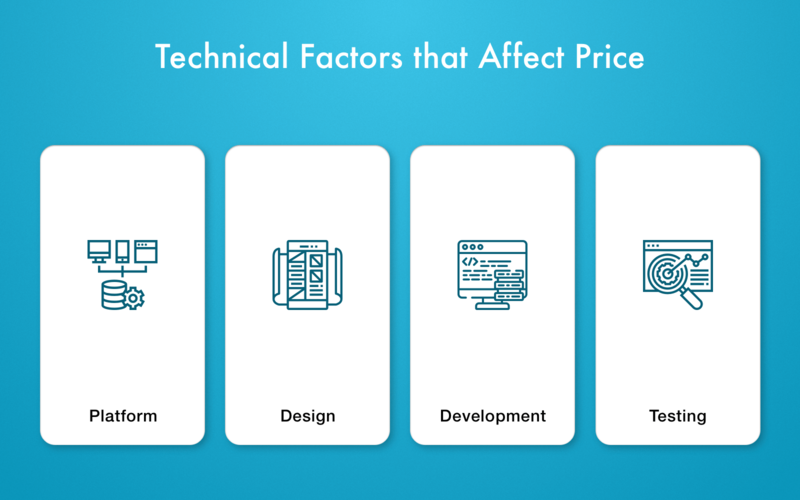 There are some non-technical factors that should be considered because they can also affect the final price. 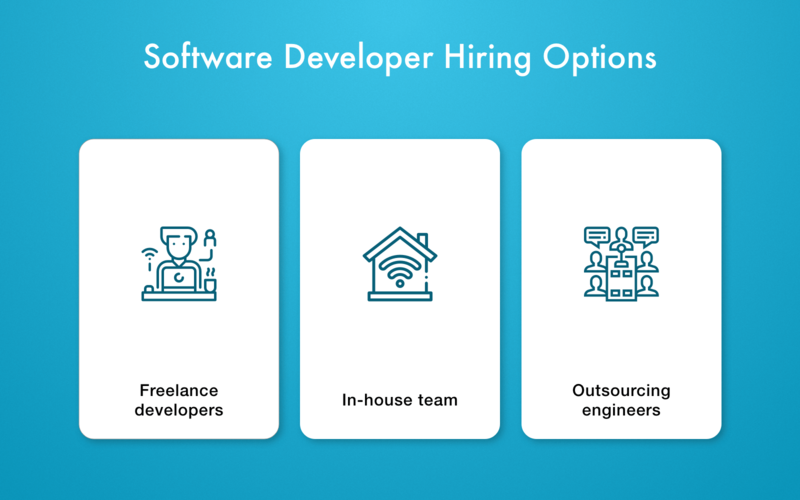 There most important of them are hiring options, staff experience, and region where the developer is from. Let’s find out more about them. Software engineers are often divided into three categories by their knowledge, skills, and working experience. 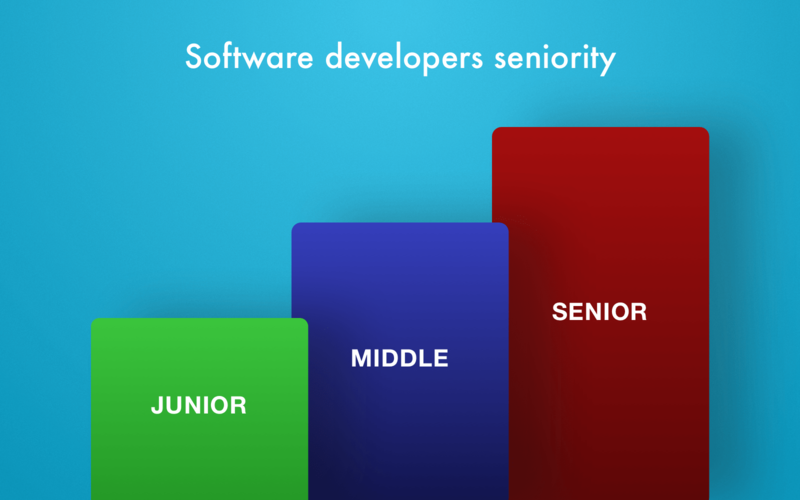 There can be junior, middle, and senior software engineers. Usually, these developers have just started their working path and still require support from more experienced colleagues. As a result, they work in a team of more qualified developers and are able to perform only simple tasks. These developers often know only one programming language or framework, as a result, they are unable to work fast enough. So, it’s better to think well before hiring the developer with such a skill set. The more engineers work, the more experience they gain. Middle developers can work on the project independently and deal with complex technical problems. This category of programmers can provide you with the most effective variants for developing your project (e.g. different programming languages, how the feature should work to cause fewer bugs, etc.). Offering these options, they are able to explain the advantages and disadvantages of choosing each of them. If you need any help in finding or interviewing software developers, drop us a line and we will assist you. As you understand, software development hourly rates may differ depending on the engineer’s level. So, think twice what developer is required for your project. If your product is quite simple (e.g. a landing page or a simple app), the junior software developer is able to conquer this task. However, if you want more complicated features (e.g. payment integration), you have to hire a more qualified developer. The more complex your project becomes, the more skilled engineer you need. Modern IT market provides quite a lot of opportunities for hiring a good software developer. The most popular of them are freelance developers, in-house teams, and outsourcing development companies. Each of these options has its benefits and drawback that we will discuss below. There are a lot of reliable platforms where you can hire freelancers. As you understand, this variant is the cheapest but not the most trustworthy. There is almost no opportunity to control the freelancer’s work. Furthermore, nobody can guarantee that your project will be finished and you will be satisfied with its quality. Having no assurance, you may face a lot of bugs in your project and just waste money. Engineers create the software in your own office, so you can follow all the development stages. You can contact the employees at any time and, as a result, any possible bugs will be solved faster. However, hiring in-house developers is always time-consuming and requires considerable investments in salaries, taxes, hardware, and software. Hiring outsourcing companies for creating certain software has quite a lot of benefits. For example, there are many offshore companies from all over the world, so you can hire developers from anywhere. As a result, you can choose affordable contract software development hourly rates because they vary depending on the region. The main drawback you may face is a time zone difference. Couldn’t find dedicated developers? Read our guide on how to hire engineers and manage them. In our experience, in-house developers or offshore software development companies are the most suitable variants. Choosing one of these options, you are fully protected and can be sure about the quality. Nowadays there is a tendency to completely different rates on software development depending on a region. For example, the most expensive development services are in the US and Australia. However, such countries as Ukraine provide qualified services for less. Let’s look through software development cost per hour from different regions. 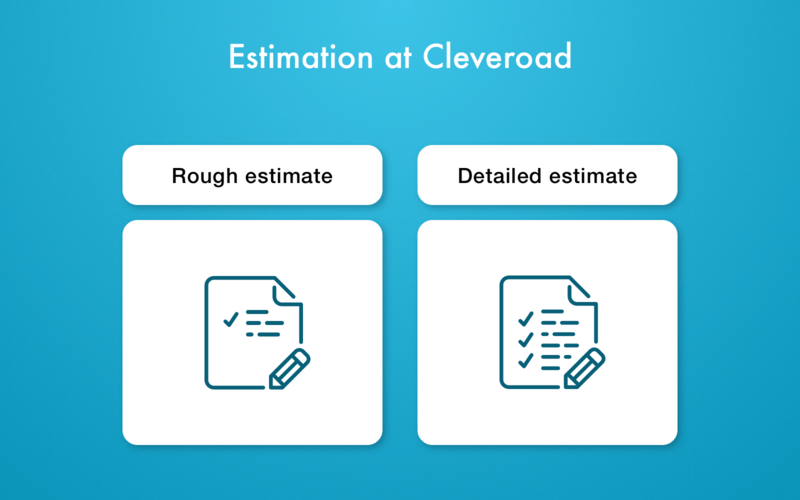 How Do We Estimate Software Development Cost at Cleveroad? In order to fulfill this step, it’s important to know only some basic information about your project idea (e.g. I want an app for drivers like Uber). After that, our specialists are able to consider vital features for MVP and time required for their development. Rough estimation usually consists of two numbers — min/max time and its accuracy are between 25 and 75%. This stage doesn’t take a lot of time, just 1 or 2 business days. This step is sometimes called the Planning Phase. During this stage, our business analyst communicates directly with a client in order to find out all project requirements. According to these requirements, they are able to make specifications. Detailed estimation consists of one number — required time. This phase lasts longer and may take from 2 business days (if you have already prepared the documentation) to 2 weeks (if we prepare documentations ourselves). Drawing the line, it’s important to understand that custom software development cost estimation is much more complicated than it seems from the first point of view. There are a lot of technical and non-tech factors that need to be considered beforehand. You may contact our managers to get a custom estimation of your project. They’ll also gladly answer any related questions.